I did some research this week looking at some of the latest research on green tea and inflammation. And here’s what came out of it. 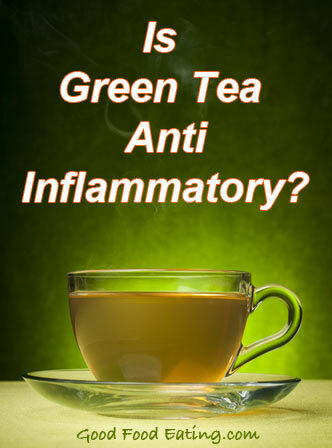 The short answer: YES, green tea is anti-inflammatory. But if you’re anything like me you’d like to know a bit more, right? 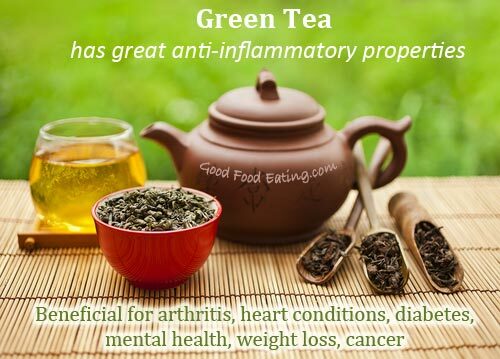 I’d love to share what I found because I was actually surprised to learn about some of the amazing anti-inflammatory benefits of green tea myself. Let’s start with the nutrient profile of green tea. Did you know that green tea and black tea are from the same plant? To tell you the truth, neither did I, but they both come from the ‘Camellia sinensis’ plant. Green tea is unfermented and simply dried, while the black tea is the fermented and treated version of the plant. This profoundly effects the nutrient profile of the two, most importantly the phenolic compounds in the plant, because these are where we get the benefits. The phenolics in black tea are only 5%, while in green tea they are 30-40%, so that’s a big difference. As you can see from the catechins, there is 59% epigallocathechin-3-gallate, and this is the one that has been shown to have some amazing benefits in reducing inflammation, reducing heart conditions, reducing weight gain, helping type 2 diabetes, aiding cancer, and helping arthritis. When we get inflammation, our body produces inflammatory cytokines, these are proteins that upregulate the immune response causing more inflammation. You probably aren’t interested too much in the technical stuff but in case you are some of these inflammatory cytokines include interleukin-6, C reactive protein, and tumor neucrosis factor-a. Another thing green tea does is scavenge reactive oxygen species (aka free radicals) and stops pro-oxidant enzymes. What that means is it stops more production of free radicals and this helps slow down the inflammatory process as well. 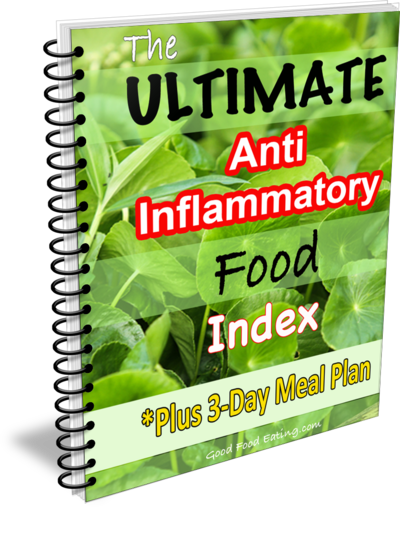 In all conditions, it’s anti-inflammatory effects are what appears to help the most. BUT it also shows many other great benefits and here are just a few I’d like to share. Studies are beginning to show some potentially great benefits of green tea for osteoarthritis and rheumatoid arthritis. All and all that means that green tea has some great benefits for people with arthritis. Reactive oxygen species (free radicals) are a major cause of inflammation in heart conditions, and we already established that green tea helps scavenge those so that’s one great benefit. Surprisingly green tea also decreases absorption of triglycerides and cholesterol and enhances fat excretion. It also has the added benefit of decreasing the oxidation rate of LDL cholesterol. This is great because oxidised LDL has been shown to be the major contributor to blocked arteries that lead to heart attack and stroke. Green tea also reduces the adhesion of immune cells to the endothelium (the artery wall). And on top of this green tea produces nitric oxide. This improves vascular function by having a relaxing effect on the arteries. When we don’t have enough nitric oxide we get a constricting effect in our arteries. And the last thing is it is anti-prolific, meaning it helps stop cells from multiplying so this prevents those lesions that build up in the arteries. Some studies have shown that consumption of green tea reduces weight gain, reduces blood glucose, insulin levels, and glucose tolerance. So it seems that green tea has multiple beneficial effects across a large variety of conditions, mostly through it’s anti-inflammatory capacity but also through a variety of other mechanisms as well. So it seems that drinking even 1 cup of green tea a day can provide benefits and drinking a few cups a day is even better. I drink a few cups a day, what about you? Singh R, Akhter N, Haqqi TM. Green tea polyphenol epigallocatechi3-gallate: Inflammation and arthritis. Life Sciences. 2010; 86: 907–918. Riegsecker S, Wiczynski D, Kaplan MJ, Ahmed S. Potential benefits of green tea polyphenol EGCG in the prevention and treatment of vascular inflammation in rheumatoid arthritis. Life Sciences. 2013; 93: 307–312. Khan N, Mukhtar H. Tea and Health: Studies in Humans. Curr Pharm Des. 2013; 19(34): 6141–6147. Bhardwaj P, Khanna D. Green tea catechins: defensive role in cardiovascular disorders. Chinese Journal of Natural Medicines. 2013; 11(4): 0345−0353. Yang CS, Chen G, Wu Q. Recent Scientific Studies of a Traditional Chinese Medicine, Tea, on Prevention of Chronic Diseases. Journal of Traditional and Complementary Medicine 2013; 4(1): 17‑23.